The Golf Industry is one of the fastest growing business's around. To stay at the top of your game, call M.P.B. Builders, Inc. to design your golf structures. Let our construction experience and knowledge be your guide to designing the perfect structure. Whether you are building a clubhouse or cart storage building; retaining walls or golf cart bridges, you can count on our structures to compliment their surroundings.To get started with your next golf facility project, give M.P.B. Builders, Inc. a call or contact us directly through our website. You will be glad you did. 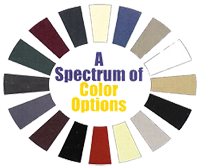 Interested in viewing all possible color options for your building project? Click on the link below to use our Color Selector!